When you create a paragraph it leaves a blank line between it and other paragraphs. If you do not want that blank line you can use br tags to break up text but keep it together. 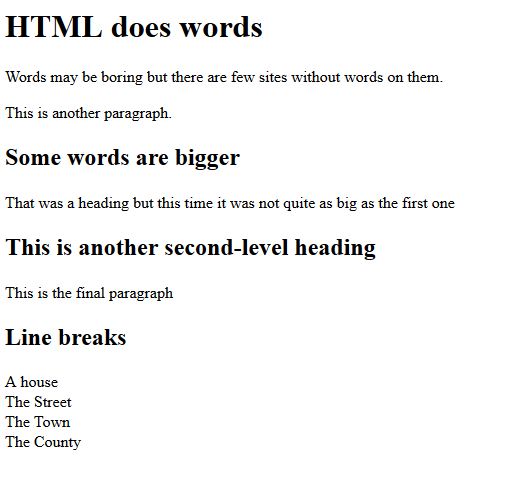 Create a page called linebreak.html by opening textonly.html and saving it with the new name. At the top of the page you can see the effect of paragraph elements. At the bottom is the effect of line breaks. Use whichever one looks best apart from one important consideration. Paragraph tags enclose a block of text which is a paragraph. They tell the browser that it is a paragraph. Line breaks do not do the same. So make sure you always put the text inside a paragraph element (like you did here) and only add br tags to tweak the layout.